A massive fire engulfed the historic Notre Dame Cathedral in Paris on Monday evening, destroying the monument’s spire and most of its roof. Fire crews and investigators are now assessing the full scale of the damage to the centuries-old cathedral less than a day after hundreds of firefighters battled, and finally extinguished, the relentless flames. Paris fire officials said late Monday that the cathedral’s two main rectangular towers had been “saved and preserved.” But the blaze collapsed the spire and consumed approximately two-thirds of the cathedral’s wooden roof. 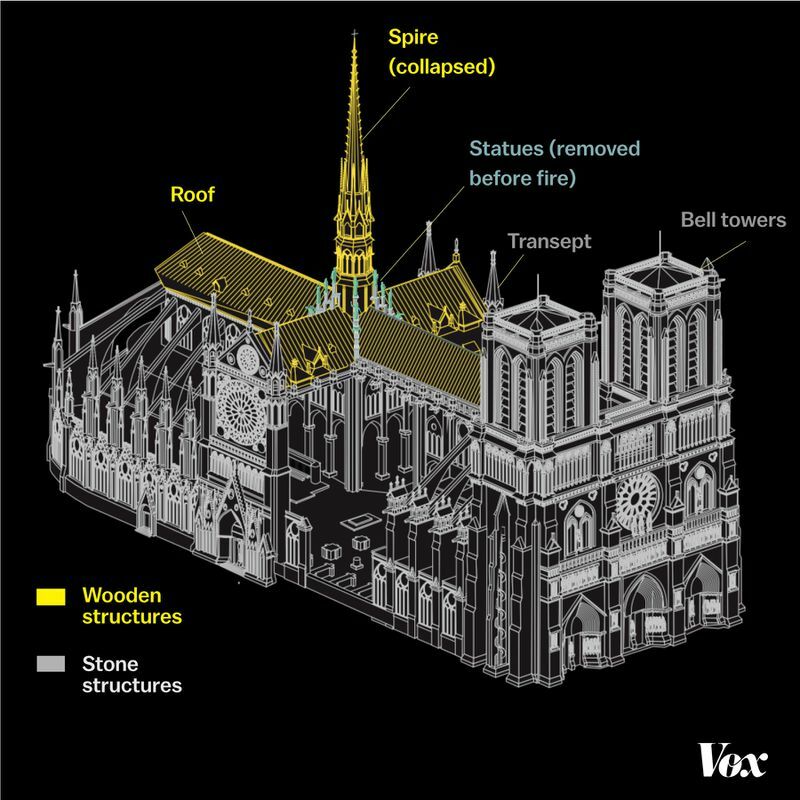 The flames damaged Notre Dame’s central nave; photos on social media showed debris littering the area, though the structure appeared to have survived largely unscathed. “Overall the structure is holding, but some vulnerabilities have been identified,” French Deputy Interior Minister Laurent Nunez told reporters Tuesday. 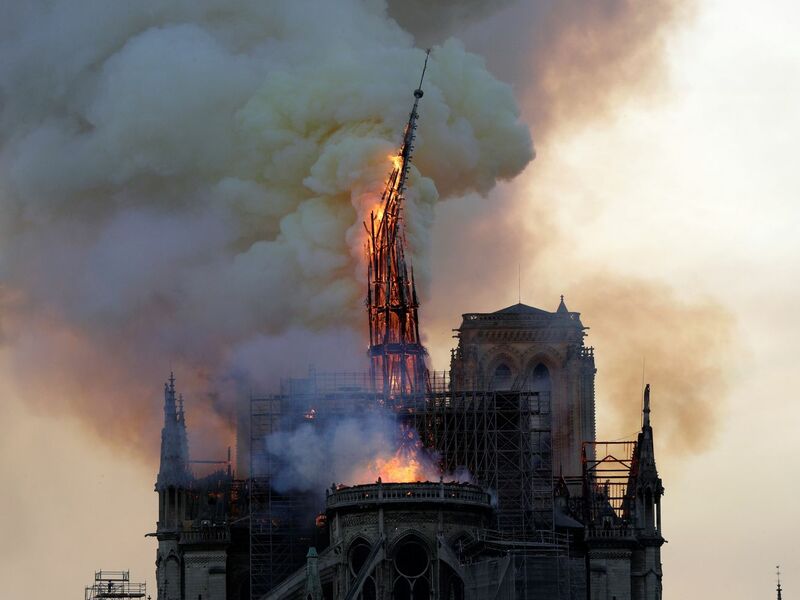 Nunez said it would take at least 48 hours to complete that security assessment, after which crews will recover the works of art — which also seem to have mostly withstood the blaze. French Minister of Culture Franck Riester told reporters that any paintings damaged by the fire should be recovered by Friday and sent to the Louvre Museum, where they’ll be stored and restored. Riester said the cathedral’s rose stained-glass windows also appear intact, though they’ll likely have to be carefully inspected. Still, many of Notre Dame’s most prized relics were saved, including a crown of thorns believed to be a “band of rushes” from the original crown of thorns placed on Jesus’s head during the crucifixion, according to the Guardian; and the tunic of St. Louis, which dates to the 13th century. A priest serving as the chaplain for the Paris firefighters reportedly helped save some of this relics. The blaze erupted at the centuries-old cathedral on Monday around 6:30 pm local time, and news of the fire spread rapidly on social media as people shared photos showing bright orange flames and smoke pouring from a spire of the church. Images later showed the cathedral’s spire crumbling, swallowed up by the fire. Jean-Claude Gallet, commander of the Paris firefighters, told the New York Times the fire likely started in the attic, which is reinforced with wooden trusses — effectively making them the perfect kindling and difficult to stop once the burning started. The cause of the fire is not yet clear, though prosecutors said a preliminary investigation suggests it appears to be an accident, possibly linked to restoration work. The 850-year-old church has been in desperate need of repairs and restoration. Notre Dame was evacuated when the flames broke out, and police evacuated the entire Ile de la Cité, the island where Notre Dame is located, by about 8:30 pm local time, according to the Guardian. At least one firefighter was reportedly seriously injured. In recent years, Notre Dame had fallen into a state of disrepair, with its buttresses eroding and its famous gargoyles replaced with piping because they were disintegrating. This prompted a massive fundraising effort to try to save the landmark, which is one of Paris’s most famous attractions. About 13 million tourists visit each year. Just last week, some of the statues atop the cathedral were removed for restoration as part of a $6.8 million renovation project on the cathedral’s spire, which was covered in scaffolding when the fire broke out. Construction began on the cathedral in the late 12th century, and the structure was badly damaged during the French Revolution. French writer Victor Hugo popularized the cathedral in his 1830s novel The Hunchback of Notre Dame, which helped make the landmark famous and galvanized the public to undergo a major restoration project in the mid-1800s. After fire officials said they salvaged the two main structures, Macron announced that the “worst had been avoided” and vowed to rebuild. Efforts to fund the reconstruction and renovation of the cathedral are already underway. According to Forbes, prominent French business leaders and companies have already donated a combined €600 million (about $680 million) to rebuild Notre Dame, including the family behind L’Oréal and the luxury brand LVMH. People in Paris mourned with Macron, with observers lining the streets as the cathedral burned. People prayed and held vigils for the monument. “It is like losing a member of one’s own family,” Pierre Guillaume Bonnet, a 45-year-old marketing director, told the New York Times. Other foreign leaders also lamented the destruction of Notre Dame and the loss to Paris and France. President Donald Trump called the fire “so horrible to watch.” He also weighed in with his approach to firefighting, suggesting that “flying water tankers” could be used to put it out. This idea was quickly shot down by France’s Interior Ministry, which noted in a tweet that water-bombing the cathedral would also destroy it.